Thanks for sharing the link, always good to see early footage! 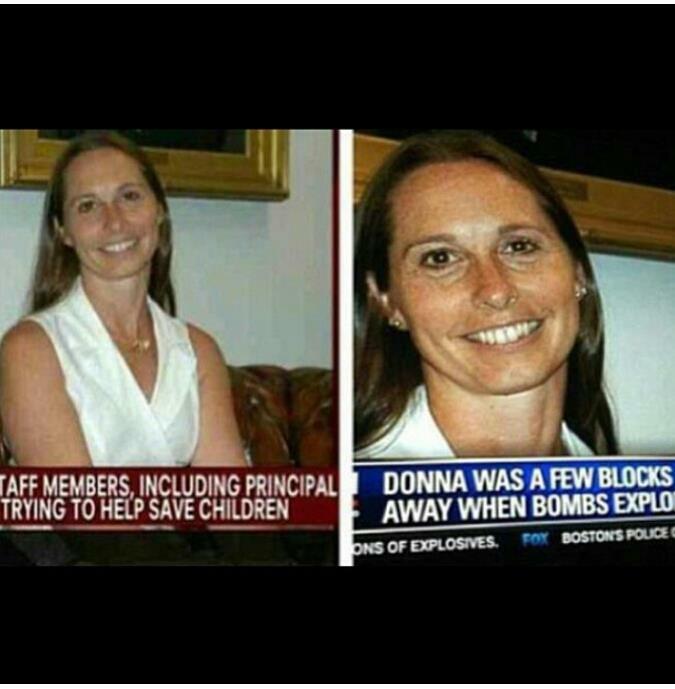 I'm more worried about the inconsistencies in the Boston bombings, lot's of back peddling and misinformation. I'd like to give a hat tip to Nana for posting these on DOTS. America is officially at war with its self. There is plenty of prior evidence of our government using extraordinary means to accomplish its goals in plain sight of everyone. I'll give you some examples, if you go to the 911 conspiracy theories section of YouTube, you will find overwhelming evidence that the plane that hit the second tower was painted gray, has no markings or windows. It was clearly a military operation. Secondly, when Tower seven fell, the entire world was watching, and nobody questioned that a basically undamaged building could implode perfectly like that. All of the video footage that is exposing the false flag event in Boston is another crime performed in plain sight, under public scrutiny. So to say that suddenly they're worried about people watching as a missile strikes a fertilizer factory would be inconsistent with the way they have operated in the past. If anybody knows the truth, by simply looking at it with their own eyes, they are immediately labeled a “tinfoil hat wearing wacko”. Other than that, I don't think they really care who sees what they're up to. West, Tx factory was a blevy! Guys, you don't need a JDAM to create that size of explosion at the West Fertilizer Company. That company is reported to have had several tanks storing anhydrous ammonia. See: https://www.ibtimes.com/anhydrous-ammonia-fertilizer-isnt-normally-considered-explosion-risk-so-what-happened-west-1201821 for some discussion on the situation at West. There is no missile trail at West and the theory is ridiculous. In my post on Main, I wrote I thought there was a smoke screen being laid out. I thought that, because I read a shoebat link yesterday (not the one Turd posted above) that said Al Ahabi was a suspect and that many members of his clan was Al Qaida linked. Given that Saudi clans can be quite big with 1000nds of members, if the clan had terrorists within the ranks would not itself prove his connection to Al Qaida. I thought that they would make up the deportation story, because they could be certain that all the 9/11 alternative viewers would immediately follow that lead, having seen it before with the Bin Laden family being quietly allowed to leave after 9/11. Also the shoebat link stated that a family member of Al Ahabi was one of the highjackers destoying the south tower. If you happen to not believe the highjacker story, then that piece of information was contradictory. Finally the pictures of Al Ahabi clearly showed that he was not one of those arab looking guys (blue jersey/no hat and black jersey/white cap) that had been circled in in the original photo upload. However, clearly the shoebat link Turd has posted, shows what looks to be him in the crowd, just standing somewhere else. So my smokescreen suspicion not valid. Further, if you notice, the last guy that the original photo upload focus on (sturdy built pakistani looking with white grey hoodie) you will see that he is directly observing the group with Al Ahabi. Surveillance or accomplice (covering someones back) or coincidence. In the other picture, where the friend of Al Ahabi (pen in neckline guy) is standing alone, the white/grey hoodie is still with him, but the question is if the thin guy in thin black jersey that is bending over vigorously searching bag, and where man in thick jacket is curious, as pointed out in the original photo dump, is in fact Al Ahabi, who is no longer standing together with pen-in-neckline-man. Can anyone explain why it looks like most of the crowd is looking up at the camera, on the big overview pictures? Only some of the crowd are looking in the direction of the runners, and many up in the direction of the camera, that is capturing a (low) bird view? I am wondering if it was a loudspeaker call coming from the same direction. The important one (the firefight itself) is worth listening to (barely anything is visible). However, official word from police commish is that 1 suspect died of gunshot wound on way to hospital. I have no idea if any of the people 1-3 are 'true' suspects, or whether any of them are the one reported dead. Note: anchor coverage of story sez 7/11 robbery first, then MIT officer shot, in contrast to graphic above. Apparently the entire town of Watertown is now locked down (no traffic in or out), neighboring towns asked to stay indoors (immediate curfew), businesses being told to stay closed, Metro transit system for entire Boston metropolitan area suspended under further notice. 'No congregation of any kind anywhere' requested by police commissioner. Mark this post.... I would not be surprised if the timing was not coincidental. The overnight pundits and reporters were asking "why did the suspects wait until tonight to leave the Boston metro area? Only after their pictures were made public and days after the attack?" If you have been paying attention to Glen Beck, he reported that the (Saudi) suspect ("person of interest".... yeah, right) that was in the hospital with burn wounds since Monday was set to be deported due to terrorist activities and / or associations after a very unplanned and quiet meeting with obottom (Soetoro) directly in the white house. After Glen's report on the air and on his network, those plans of deportation were suddenly put on hold. This was yesterday morning he broke that news. His sources were very well placed individuals and verified more than once. Now the suspect since Monday was reported to have been seen with one, possibly two others at the scene on Monday. These others have since been identified. Overnight, two suspects (identified as suspects now by the FBI) decided to get out of Boston. Yesterday, the deportation was stopped. My guess is those other two had been assured they would be able to escape with Monday's suspect and get a free ride out of the country. Once their flight was canceled, THEN they needed to get out of Boston by land.... any way possible. A robbery at 7-11 and a carjacking? How unsophisticated. But I guess you have to resort to whatever means are available knowing that your promised ride isn't there and the public forms of transportation are all monitored with security cameras and facial recognition software. Why did they wait several days otherwise? Zerohedge said watch and see Saudi Arabia will buy a few trillion of US Treasuries. Turd.... you're right about the petrodollar. I bet the Saudi held in the hospital will be allowed to leave... and the story will soon be these two others were the only suspects and both were killed in the pursuit (one already has been). Watch closely at the 1:22 mark - as the 5000 lbs of explosives detonate at the bottom of the screen it appears that an explosion takes place high in the air directly above them. It could be an odd reflection in the camera's lenses, or some physical process - I don't know. What I do know is that in the Mythbusters clip no missile was fired into the explosives. I'm with you ammonia nitrate is powerful stuff. The point I was trying to make about the j-dam was that the story linked to "the missile" attack story was using a video of a "j-dam" explosion as corroborating evidence of a "missile strike". The point being that they were comparing apples to oranges, not that it was a missile or bomb attack. I believe with the evidence so far this was an accident. Craft workers posing as cops at Sandy Hook!!! The aunt of the 2 accused terror suspects in the Boston bombing lives in Toronto. She's being interview on local CP24 TV. She claims the photos showing her nephews walking apart from each other is not how they normally behave, which leads her to conclude the photos are doctored and the whole thing has been staged. Of course, one would expect a family member to react in disbelief/denial and say something like this. I'm merely giving the info as it's being fed by the MSM here in Canada. Meanwhile, it's weird to watch the huge police and military build up going on. With all the armoured vehicles etc it looks like a pending DDay invasion. What strikes me is how casual the scene looks. Apparently there is little concern that the suspect is nearby, or you'd think they'd be cowering from possible gunfire. It looks to me more like orders have been given to mass the forces in one place (and gather the prying eyes of media there too) while the main stage gets prepped elsewhere for some big event. I am sorry to say this, but something feels very very bad about this lull in the storm. Earlier today police were looking for the suspect driving a Honda CRV. Apparently the missing suspect busted through some kind of blockade after a shootout with police and got away. In a Honda CRV? Are you f*cking kidding me? And if a shoot out had been going on and the brothers were lobbing bombs don't you think the police guns would not have been drawn already? With guns already drawn could they not hit a car as it drove to, through and past them? One thing is clear so far....these 2 guys are alleged to have used bombs made from instructions downloaded from Internet and possibly using reloading powder in the process. (How the bomb sniffing dogs at the finish line missed them is beyond me). I remember sometime last year, an artist that did images of major cities vacant like this. This is what martial law looks like. Those people who live there need to tell the "militarized forces" they do not have any authority to enforce "lock down" aka martial law under the Constitution. "The trail has gone cold." So all we saw today was a practice run for martial law. What did I say when Sandy Hook would no longer serve its purpose? Will they burn him alive too, Dorner Style. What a joke. Here in Canada on the CBC news all they talked about is how weak the American government is for not passing that gun control bill that could have possibly stopped this. Heard that too Galt about the aunt then they have the uncle come on a wash it all away with "give yourself up, you are a disgrace to all Chechnya ....blah blah blah"
I won't rehash all the Sandy Hook thread.... if you want to review it, you can do so here. Basic take-away: Sandy Hook was a false flag and major fraud at that, when it was discovered to be so (or it no longer served its purpose) I said watch out for what was next. This week, we found that out. Plan A at the beginning of the week was that the Senate would pass the background check bill. Based on this assumption, a FF (but entirely REAL) attack would take place with the help of those that were 'promised' safe passage after the attack. This attack needed to happen at a civic event in a large city. Boston was the perfect candidate for the timing. This attack was to be blamed on a right wing individual and would later be revealed that it was in response to upcoming restrictions on the second amendment, namely in the form of background checks, that was supposed to have passed. This would get the sheeple on board to vote in a Democrat / Socialist-Progressive House in 2014 in the emotional aftermath of the Boston attack. On Friday (today) we were supposed to be watching the news about how the DHS and others raided the scapegoat's house and discovered he was a right wing white male with NRA literature. This meme was supposed to be the subject of all the DLM (Dishonest Liberal Media) Sunday morning talk shows this weekend. I would say they were already getting the pump primed for that meme by announcing it was a right wing group responsible for it within the first few minutes of the breaking news on Monday, but because they have a pavlov dog response to any terror attack to blame bush or the tea party, one can not make that association. The Senate did NOT vote for the background checks, and a very visibly upset Soetoro was infuriated. There were also a few people in this regime that have blown the whistle and have revealed that the real individuals behind the attack were about to be flown out of the country on a get out of jail free flight. When that news came about, the two who carried it out were then advised they were on their own to escape and could no longer rely on a midnight flight to escape. They did not have a back-up plan and as such, ended up acting like totally amateur bank robbers to get away. They stayed in the city for days after the attack and before their pictures were posted around the world thinking they were going to be flown out as promised by their financier. You can guess who that was. He had a meeting this week with a puppet. Today we saw the same plan for the day go into effect. The DHS and others needed to practice locking down an entire city in preparation for nationwide martial law. Think of it. AN ENTIRE CITY HELD HOSTAGE BY ONE INDIVIDUAL BECAUSE WE WERE TOLD ALL DAY THE SUSPECT WAS HOLED UP IN A 20 BLOCK AREA. No public transportation. Residents 'requested' to stay in. House to house searches with the police coming to your door. Residents told not to answer their doors except for uniformed law enforcement. If Sandy Hook was not enough to get 2nd Amendment restrictions passed, then perhaps what is needed is a threat of one individual suspect who can terrorize an entire city to help initiate martial law for another end-run arounsd the second amendment. Not every city can be victim of a hurricane, like New Orleans. Get some hired terror cells to do the dirty work and they can be spread anywhere. Sandy Hook was a fraud. Nothing about that was real. The 'parents' cried more genuine tears at the speech Soetoro made upon the failure to pass than they did in any video they appeared in on December 14 at the scene, that evening, or since then. Robbie should have just read from the card and not asked questions. It would have helped if he had already been in character as well. Today the city of Boston was nothing more than a test run for martial law on a city size scale. I hope the whistleblowers win this one. The truth needs to get out. And mighty fast, too. What we are witnessing is a civil war in our government between those in 'power' and those career workers (non-political appointees) who believe in the constitutional government..... the one they all took an oath to uphold upon being hired. Even they have had enough. It's time we support them and not the political appointees who have some kind of psychotic obsession to maintain power for themselves, so much so that the need to murder people (and children) to keep the sheeple thinking they need to give up their rights for security. And of course, I mean bring about peaceful change and resistance. Unlike the power hungry psychos infiltrating the goobermint that will kill (or hire others to do so) offensively for their power.